This policy applies where pro-manchester Limited (referred to as “we”, “us” or “our” in this privacy notice) identify as the data controller and where we are responsible for your personal data. pro-manchester Limited is a company registered in England and Wales registration number 05001675 whose registered office is Level 9 – Tower 12, 18/22 Bridge Street Spinningfields, Manchester, M3 3BZ. pro-manchester does not collect sensitive personal data about you – if we were to require it for any reason, we would seek explicit consent from you to gather this. Where we are legally required to have your explicit consent to process your personal data, you have the right to withdraw consent (where applicable) at any time by emailing us at info@pro-manchester.co.uk. Where we do share your information with third parties, pro-manchester ensures that the highest levels of data protection are in place in accordance with the law. Third parties with whom we share data are only permitted to process this data for the specified purposes we stipulate with them. Please email us at info@pro-manchester.co.uk if you want further information on the specific mechanism used by us when transferring your personal data out of the EEA. pro-manchester takes the security of your information extremely seriously. In order to protect your data, we implement a risk-based approach to adopt the strongest organisational and technical controls in order to protect the confidentiality, integrity and availability of your data. We undertake regular assessments of our information security and have certified to both the IASME governance and Cyber Essentials certifications. Your data is encrypted whilst stored in any of our systems and whilst in transit, and our systems are protected by robust and resilient cyber security controls. We keep this policy under regular review. This policy was last reviewed on 16th May 2018. Any questions about this policy can be directed to our Data Protection Manager via the details set out in section 1 of this policy. location, we may also need to confirm a postcode. SnapEngage stores your information for 60 days. 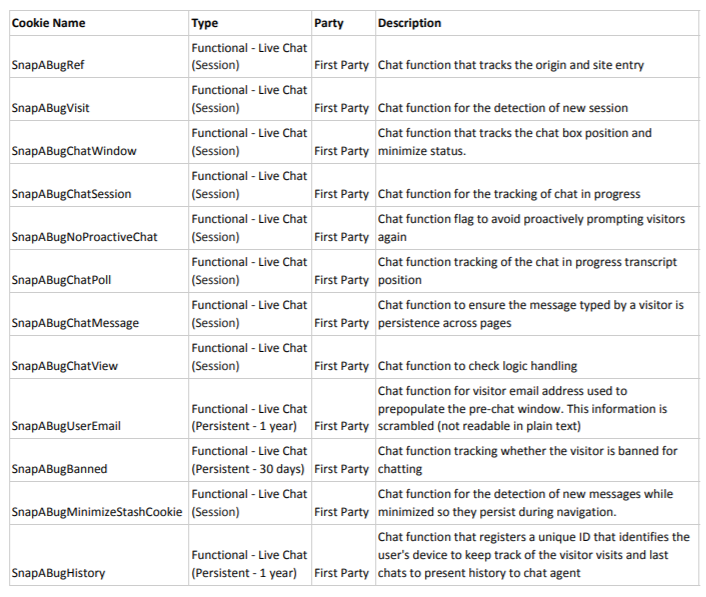 Our live chat service uses functional cookies to allow it to function properly. For further information on these cookies, please see our cookies policy, which is available above. are able to respond to your enquiry as quickly and effectively as possible. identify what we have said to whom and when. Legal basis for processing​: necessary to perform a contract or to take steps at your request to enter into a contract with you (Article 6(1)(b) of the General Data Protection Regulation). that we can provide you with the information you need in order to be able to enter into a contract with you. period in which a claim form can be issued and served in respect of contract and tort claims under the Limitation Act 1980 under English law. Live chat information you submit to us by email is transferred outside the EEA and stored on SnapEngage’s servers in the United States of America. Country of storage​: United States of America. This country is not subject to an adequacy decision by the European Commission.